If you need the services of ISD, contact your local law enforcement agency. The sound of panting and the smell of dog breath filled the Kootenai County Search and Rescue building in Hayden on Sunday afternoon as a group of people and their pups learned the ins and outs of search and rescue. In collaboration with two instructors from Ravalli County Search and Rescue in Hamilton, Montana, about 16 volunteers took lessons on first aid, restraining techniques and where to locate a dog’s pulse. Their canine companions, meanwhile, were schooled in an activity more suited to their acute sense of smell – tracking. 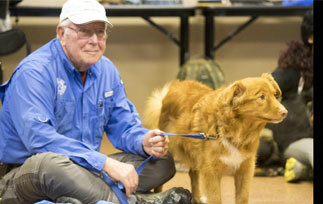 Before long, many of the dogs will receive certification to become official search and rescue animals. Read entire article on Spokesman-Review. If you would like to request the assistance of Intermountain Search Dogs for a search in your area, please contact the SAR Coordinator, Deputy Thad Schultz via email.